From the first, Andy Botwin has been one of the more problematic characters on Weeds. Back in the days when the show was a suburban satire, he was the slacker brother who kept trying to come up with plans to avoid doing much of anything. He was the show’s fool, the guy who was mostly there for comic relief but offered occasional profundity on a variety of topics. But the show has always been a little uncertain of how to play him, and he’ll seem like he’s about to undergo change but not so much change that he would become such a different character that he could no longer play the role the show had for him. Over the years, as Justin Kirk’s portrayal of the character has gotten more assured, he’s become the one guy who can truly call Nancy on anything, but he’s also the goofy guy no one can trust. The show often seems of two minds about him, and that’s been occasionally irritating. This season, though, Weeds has seemed dedicated to pulling Andy back from the brink of unbelievability most of the time. It hasn’t always worked, and the show has fallen back on its habits of having him be the least responsible person in the room too often, but for the most part, the pursuit of Audra has seemed to spark a certain amount of self-awareness in Andy. When he calls Nancy on just how much she’s screwed everything up in “Glue,” it sticks more, as though the show really means it this time. Indeed, rather than dropping in the idea of Nancy’s profession screwing up her kids out of nowhere as the show has done in the past, the series has been building to this moment since Shane was shot, and that made it sting even more. Getting Nancy and Andy to that point required a few hoops jumped through in the plot department, including getting Andy to accompany Nancy down to Mexico to take care of her little Esteban problem. I realize that Andy doesn’t have a life, but having him always be down for accompanying Nancy on these adventures stretches credulity, as does the thought that he’s so rapidly fallen in love with Audra (cool though she is) and now wants to propose to her. (Though that may just stem from another of my TV pet peeves – characters who fall in love so suddenly that they simply must be married within a few days or weeks of beginning their relationship.) So, naturally, he has to come along to ask Nancy if he can have the ring Judah gave her when they got engaged. It didn’t ruin the plot irreparably or anything, but it was a bit strained as a set-up. Then again, the scenes in Mexico were about as good as this show does, wrapping up the serious look at how Nancy’s screwed up her life and family inside of the device of having Andy ask her questions from a quiz designed to show how deep her love was via a magazine quiz in something called Women’s You-niverse that purported to measure the depths of a relationship’s affection. I’ve seen this device used a couple of times before, but here, it was a pretty nice satire both of those sorts of quizzes and of the way Nancy and Andy’s relationship has that uneasy competitive element to it. And since it concluded in that scene where Andy castigated Nancy and she seemed to take it to heart, all the better. Then again, the whole thing concluded with Pilar sucking Esteban back into her web (just in time for the season finale! ), so not everything here was as good as it might have been. While all of that was going on, Silas and Shane were stuck at home with Esteban’s daughter, who had some friends over. Both were rich, ritzy chums of hers, both the sorts of guys Esteban wanted her to date, apparently, but they were also assholes, and this led to Silas trying to save her after she smoked some heroin and passed out (and the guys tried to take advantage of her). Though it was Silas who launched the rescue, it was Shane who ended up playing the most vital role, as he pressed a knife to one of the guy’s throats. Shane’s slow descent into complete antipathy for the entirety of the human race has been one of the more well-developed character arcs on the show, and seeing him finally explode into violence was both a long time in coming and a queasily believable development. As we head into the finale, the show is finally playing fair with Nancy’s character and the way that she’s hurt everyone around her in one way or another. More importantly, she’s realizing this in a believably organic way, instead of just having it wash over her all of a sudden, as might have happened in the past. Yeah, there was clumsy stuff in this episode, but I’m feeling oddly optimistic about how this all might turn out as we head into the finale. Sure, there will likely be an out-of-nowhere twist of some sort, but that’s the kind of thing that I’m almost used to on this show. I’m hopeful that this season will close strong, befitting the early episodes of the season instead of that long, dreary midsection. Hunter Parrish’s delivery of “Agrestic … High” was pretty great. He’s not the funniest actor in the world, but he does uncomfortable dumb guy pretty well. I would absolutely be a charter subscriber to Women’s You-niverse. 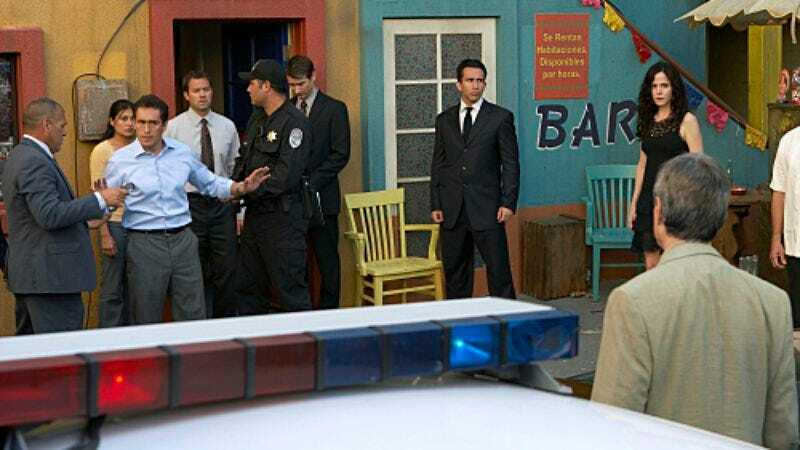 No photos for this episode, so enjoy this repeat of Esteban getting arrested. Last chance to make predictions of what’s going to happen next week. Considering how many times the word “shot” was used in the next-week-on preview, I’m guessing someone’s going to get shot!